Spend some quality garden education time at the home of artist and gardener Linda Horn: local naturalist, habitat restorer and self-taught arbiter of going native and sustainable! 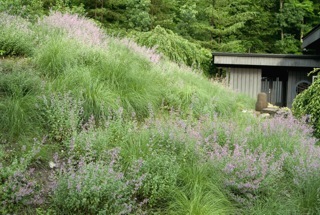 Inspired by the tall-grass prairie of Michigan, in 2005 Linda installed a one-acre Eastern meadow on her property, which has developed into a fully established sustainable ecosystem and is a haven for beneficial insects, birds, and wildlife. For the past few years, she has painstakingly and systematically removed the extensive non-native, high maintenance plantings (including scores of perennials, bamboo, petasites, and more than 40 rose bushes) that she inherited when she bought her house and replaced them with native plants specifically chosen to create habitat for wildlife (prairie dropseed, corydalis, ferns and catmint). She’s not a purist, so a limited number of pre-existing plants like peony, hosta, darmeria and rhododendron have been allowed to remain. Come and learn from Linda’s vast experience about how to create a natural, low-maintenance landscape or convert your existing space and lawn into a vital eco-system. The morning will start with a tour and explanation of the work undertaken on her beautiful property. A light lunch will be followed by Linda tackling specific issues and sharing techniques and sources. If you have problems to conquer in this area, participants are asked to bring photos (on your iPhone or tablet) and written questions. Pictures of Linda Horn’s meadow can be viewed on her website www.lindabhorn.com. Click on the Terra Constructa link. Boots and sunscreen are recommended. Reservations necessary, space is limited. Contact Spencertown Academy 518-392-3693 to reserve.